I went into this novel with a totally open mind. I wasn't sure if it would be over the top with romance, or if the romance would be downplayed. Come to find out it was the perfect happy medium. The characters were very well rounded and seemed like real life people and I loved that. Relatable characters really pull me into a story. Grace's relationship with her mom was so real, and the struggles she faced on a day to day basis with her sexuality will hit home for many teenagers today. I read this book several weeks ago and have been thinking about it non-stop ever since. The characters were so beautifully developed and complex. Grace showed amazing maturity and strength through the ups and downs of her relationships and the reader observed her as she hit her lowest of lows and had to rely on her friends to help bring her back up. Each character was lovable, and I couldn't seem to shake off how much I started to care for all of them. I wanted to see them happy, successful, and in love. Herring did an amazing job of really pulling the reader in and making us cheer for the characters. 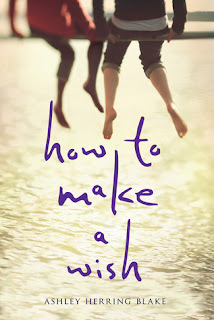 All in all, How to Make a Wish is a solid romance novel filled with a little dysfunction, a lot of grief, lifelong friendships, and a story of how pain and a jar of peanut butter can form an unbreakable bond. I absolutely loved this novel and will be recommending it to readers who enjoy young adult contemporary novels. It is a must read this summer! *I received an advanced copy of this novel in exchange for an honest review.